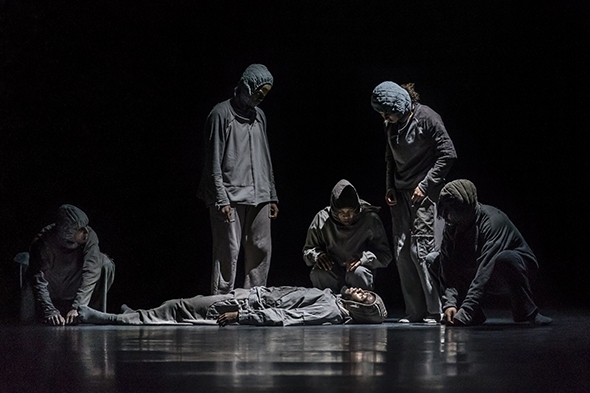 Marking its refurbishment 20 years ago as a production house catering uniquely to dance, Sadler’s Wells has commissioned 20 new works, three of which form Reckonings, a celebration of the future featuring UK-based choreographers Julie Cunningham, Botis Seva and Alesandra Seutin. Sadler’s Wells has lavished its production capacity on each and the result is a richly textured triple bill unified by Tom Visser’s lighting that demarcates regions of the stage into which the dancers can withdraw from sight and from which they can emerge; there are no theatrical exits and entrances. This corresponds particularly with the fluid spatial staging of Cunningham’s m/y and with Nell Catchpole’s engulfing interior soundscape. 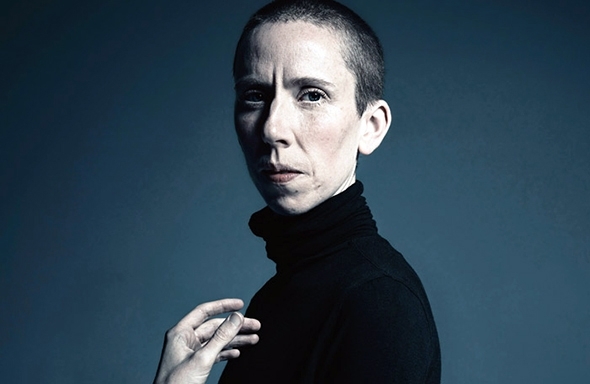 The work is a translation into choreographic form of Monique Wittig’s attempt in her novel, The Lesbian Body, to ‘create a new language that can function outside the dominant structures of patriarchal power’. It is not the cast of six women — Cunningham, Eleanor Perry, Hannah Burfield, Seira Winning, Sara Ruddock and Stephanie McMann — that suggests a lesbian discourse but the subtle structures that link them together, a fine weaving of almost abstract strands with sapphic overtones that creates a space in which no muscular, patriarchal figure would ever feel comfortable; the performers, dressed in Alexa Pollman’s body suits with diaphanous outer layers, seem to relish this independence. It is a pleasure to watch the way Cunningham opens up the space with such intellectual rigour; it starts in muffled containment as if the cast is an operatic chorus in a prison cell and develops into a sense of lightness and emancipation that Catchpole’s score reaffirms in its trajectory from dark clouds of industrial effluence to the open air, from interior rumblings to serene silence. After the first intermission the contrasting, dark masculine energy of Seva’s BLKDOG is immediately palpable. In combination with Visser’s lighting, Ryan Dawson Laight’s wrapped anonymous costumes and Torben Lars Sylvest’s visceral score, Seva has invented a haunting, powerful reflection on depression inspired by Sally Brampton’s Shoot The Damn Dog. It was Winston Churchill who termed his depressive condition ‘The Black Dog’ from which Seva derives the title of his work and on top of Sylvest’s score are recorded voices from an imagined therapy session: ‘Let’s start with how you’re feeling.’ Set in a hip hop vocabulary on six dancers — Joshua Nash, Jordan Douglas, Ezra Owen, Victoria Shulungu, Shangomola Edunjobi and Naima Souhair — BLKDOG seethes with an inner malaise that explodes in tight, controlled gestures and broods in hooded acquiescence. Seva has developed an intricate and eloquent language within an urban context that manages simultaneously to get inside the head and flow through the body, seamlessly bridging emotional abstraction and a harrowing social narrative — an effect that is more Crystal Pite than Hofesh Schechter. In a work that depends for its affect on precision in both individual gesture and unison articulation it is a tribute to the dancers and to the rehearsal director Ekin Bernay that Seva’s conception is so fully embodied. Like the two previous works, Seutin’s Boy Breaking Glass has a literary inspiration, this time through Gwendolyn Brooks’ poem of the same name. Breaking glass becomes in Seutin’s conception a metaphor for breaking through what may seem transparent but proves impassable, otherwise known as inequality of opportunity. She writes that five other authors ‘were all invaluable in my research about inequality, the act of survival and self-love.’ The problem is that however clear Seutin may be in her intellectual research such clarity fails to coalesce on the stage. From the outset there is a contrast between the formal volumes of the set — a broad white platform at the back for her five-piece band with a white dance floor bordered in black for her seven dancers — and the informal, folk-inspired choreography ‘inspired by Senegalese and Southern African traditional and social dances’. Visser’s liminal lighting is again on display but he seems unsure how to unite these contrasts. The members of the band are visually dominant which gives an importance to their presence and their music over the narrative taking place on the stage below them, while Randolph Matthews as the central figure among the dancers — the victim of inequality — is a vocalist. Attention on the primary theme is thus dispersed among the performative elements and while they are independently rich in expression, Seutin and her dramaturg/co-director Maxwell Golden have not succeeded in synchronizing their full value. The final party of Dance Umbrella 2017 at Shoreditch Town Hall continues the festival’s experiments in matching dance and architecture, the body and its forms of expression. The theme of Shoreditch Takeover could well be the power of the moving word: Julie Cunningham & Company’s Rays, Sparks, Beating Glows is inspired by the writings of French feminist and literary theorist Monique Wittig; Lisbeth Gruwez embodies the songs of poet Bob Dylan, and Vanessa Kisuule performs a selection of her own poetry. For the word-weary there is Charles Linehan’s 18-minute choreographic film, The Shadow Drone Project, that loops silently in a space of its own throughout the evening. Shoreditch Town Hall was never designed for dance, but this pairing of dance and spoken word neatly blends its municipal role with a temporary focus on communicative performance. Coming into the elegantly proportioned Assembly Hall for Rays, Sparks, Beating Glows, there is a heightened sense of order in the rectangle of black floor, the haphazard arrangement of lyre-backed chairs — some upturned or leaning against another like the silent aftermath of a domestic quarrel — and Richard Godin’s diffused lighting with the faintest whiff of haze. Three women enter in the dark; Anna Martine Freeman sits but in a gentle light Hannah Burfield and Londiwe Khoza start to recreate in halting, abstract terms their personal quarrel to which the mute chairs bear witness, an irretrievable chasm within the suggestion of an embrace. Freeman remains silent, untying her boots as she recalls through her skin the discomfort of the injurious past, when from behind the audience Cunningham enters noisily into the present like a latecomer in a skimpy black outfit supported on high-heeled boots and topped with a long unruly blonde wig. She minces directly to Freeman and climbs over her like an exotic dancer called upon to perform for a client. Cunningham’s raw, explicit imagery contrasts emotionally and spatially with duet of Burfield and Khoza, who wait for the right moment to slip away. Off come the wig and boots as Cunningham explores the relationship between Wittig’s textual imagery (delivered by Freeman) and her own. But while Freeman gives a forceful, emotionally mature reading through her gestures and the very texture of her voice, Cunningham’s response feels self-conscious, lacking the emotional potency conveyed in the spoken words. By the time Rays, Sparks, Beating Glows finishes, the order in the room has been replaced by a sense of unease. Downstairs in the Council Chamber, Vanessa Kisuule presents a colourful set of her poems, following on from Freeman in delivering not only the words but the gestures that carry them. Dance is a non-verbal art form but used in the right way Kisuule reminds us these silent gestures move through figures of speech and poetic images in celebration of the sensual non-verbal eloquence of the poetry. Kisuule whets the appetite with a poem entitled Rosé, and follows it with a ribald tale about shaving assholes (‘the crassist of bathroom ballets’) before delivering in a soft patina of an American accent a dark, poignant reflection on Martin Luther King told through the voice of one of his lovers. Effusive, expressive and irrepressible, Kisuule then reads a touching tribute to her Ugandan grandmother before a final bullet-point poem of irreverent reflections. Back upstairs after the intermission, Lisbeth Gruwez and musician/composer Maarten Van Cauwenberghe stand behind the sound console with the relaxed attitude of old friends and the nervous excitement of waiting for the audience to settle. Lisbeth Gruwez dances Bob Dylan is what’s written on the tin, like the iconic covers of Dylan’s early vinyl LPs resting on the floor against the console. Van Cauwenberghe slips out a record on to a turntable and lowers the needle while Gruwez stands in bare feet and casual clothes, an image of expectancy in a field of energy. These are early songs, fresh, acoustic and enthusiastic; again we are reminded that words move and transport us into the worlds they create through the sensuality of sound and inflection. It is difficult to establish exactly where Gruwez positions herself in these songs though she is rhythmically attuned and the odd gesture picks out an accent in the poetic sequence of words. She is neither illustrating the songs, nor simply doing her own thing with them; it’s as if she has turned the rasp and lilt of Dylan’s dancing voice inside out and given it powerful, fluid gestures and an intense gaze; at times she even resembles Dylan. She relishes the verbal musicality, capturing the idiosyncrasies of Dylan’s alliterations, the expansiveness of his metaphors, and the minimalism of his synecdoche with exuberant delight and elegant nonchalance, but at the same time her gestures set up other images. Walking slowly upstage in Knockin’ on Heaven’s Door, her white silk shirt sticking to her skin and emphasizing the muscular rippling in her back, she is like the lonely hero in Wim Wenders’s film Paris Texas; in the glorious Sad Eyed Lady of the Lowlands we see her floating bare-legged on the floor in a pool of light that Van Cauwenberghe guides around and over her, reflecting in the shiny black surface a seamless depiction of femininity in Western art from Venus to St Theresa. Catching her breath, she tenderly asks the audience ‘Is everyone all right’? Gruwez is very much at ease on stage; she comments on her own actions and jokes with Van Cauwenberghe in asides between songs and then climbs back inside the voice, romping delightfully through Subterranean Homesick Blues before inviting us to select a song (Hurricane is chosen), take off our shoes and join her on the stage to dance Bob Dylan together. In the intermission, there were too many people in the room watching Linehan’s film projection, The Shadow Drone Project, to be able to stand back and contemplate Karolis Janulis’ (already) long-distance photography from a drone of dancing figures in various landscapes. We returned after Gruwez and before the DJ had started up in the Council Chambers. Linehan has made choreographic poetry of the aerial photography by featuring the extended shadows of dancers in the late sunshine; we are watching their patterns superimposed on the dancing patterns of the landscape or shoreline. It’s a serenely simple concept and the result takes dancing to another distant realm, totally enchanting and surreal at the same time.